It takes a lot for something as bland and functional as a press release to make an impression of any sort. So credit is due to the august Bahrain News Agency for releasing one of the most absurd and imbecilic texts ever allowed to see the light. Manama, April 26 (BNA) — His Majesty King Hamad bin Isa Al Khalifa sent a cable of thanks to His Royal Highness the Prime Minister Prince Khalifa bin Salman Al Khalifa, in response to HRH’s cable of congratulations to HM on the success of the Bahrain Grand Prix Race. HM the King extended his thanks and appreciation to HRH the Prime Minister for his great role in supporting this combined effort by all loyal and honorable citizens of Bahrain. He also expressed his pride at the success of the F1 race on a local, regional and global level, which proved that the people of Bahrain have the readiness and high patriotic spirit that qualifies them to carry big responsibilities and rise above to overcome challenges in order to achieve what’s in the interest of this country. You read it right: a press release that brings us the urgent breaking news that the king has said ‘thank you’ to his prime minister (and uncle) in response to the prime minister saying thank you to his king … in response to the king hosting a ‘successful’ Formula One Grand Prix event. Sharp-eyed readers will have noticed that I’ve put ‘successful’ in inverted commas; as I’m still getting the feeling a different word might be more appropriate in this instance. After all, when William Hague – the very person who sold you your weaponry and tear gas – finds himself compelled to publicly ask you to tone things down a notch and “show restraint”, it’s probably time to reconsider how ‘successful’ is this ‘success’ you’re being so chuffed about. Indeed, when not sending each other state-sponsored billets doux, Bahrain’s rulers might want to take a look at what journalists who’ve tried to cover the events over the weekend had to say. After all, it takes a lot for mainstream media operations to go off-message; so when you pay a PR agency 1.5 million pounds to fix your image abroad only to find hitherto-dependable establishment organs such as the BBC and the New York Times openly describing your actions as a “regime crackdown”; and when even meekly outlets such as the Daily Beast start calling you “tyrannical”, you really ought to start paying attention. I don’t know about HM and HRH, but – no matter how the PR agency spins it – this seems a rather quaint thing to say about an event that had achieved “success… on a local, regional and global level”. The RWB report is worth reading in full, though some illustrative highlights should suffice here. The report shows the Grand Prix to have been so successful that Jonathan Miller and his Channel 4 News crew were chased by riot police, arrested and deported for filming a protest. Also part of this success were journalists working for British, Japanese, German, Danish and other news outlets, who were also arrested and threatened. Let us remember that the wonderful Grand Prix weekend featured the not so wonderful killing by security officers of Salah Abbas Habib al-Qattan, a protester shot on Saturday night and whose body was held back from his family for more than 24 hours. Why the delay? Because the authorities didn’t want his funeral to take place on Sunday, as would be customary under Islamic law, so as not to spoil the fun and cheerfulness of the race goers. When the body was eventually returned to them so they could bury him, it was found riddled with birdshot and bullet wounds (you can see the graphic images for yourself). In the meantime detained human rights activist Abdulhadi Alkahawaja today entered the 78th day of his hunger strike – having stopped taking water and liquids since April 19th. His family and lawyers have had no contact with him since April 23rd, despite repeated pleas and requests. Many are fearing the worst. Inexplicably, none of this seems newsworthy enough to register on the BNA’s radar, presumably due to the backlog of in-house Thank You notes and self-congratulations still in the pipeline. But not to worry, John Yates, former senior UK police officer currently in the pay of the Bahraini monarchy, is on hand with his “nothing to see here, guv’nor” comic relief routine. Indeed, as far as ‘Yates of the Yard’ is concerned, “the abiding image I have of the Grand Prix last weekend was of thousands of people enjoying themselves at the post‑event parties.” Of course, this is the same John Yates who, after taking a long hard look into the original 2006 phone hacking investigation, had concluded there was “nothing to see here, guv’nor” there either. You might start to see why the Bahrainis thought he would be just the man for the job. 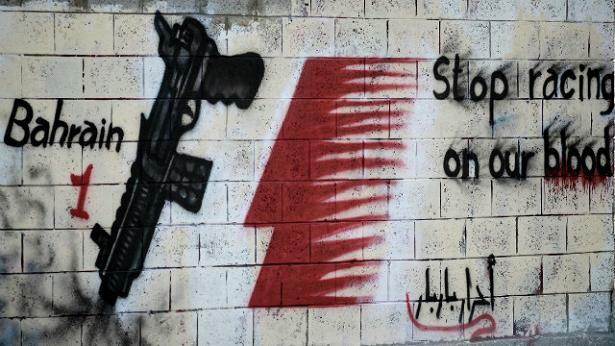 The Bahrain Formula One GP sham has been an object lesson in the political and moral bankruptcy of our age. When calls rose for it to be cancelled, the obscene Bernie Ecclestone called security fears a “bunch of nonsense” while William Hague tamely maintained this was “a decision for the F1”. For her part, UK Tory Chairwoman Sayeeda Warsi, when asked why Bahrain’s King was a guest at the Queen’s forthcoming diamond Jubilee celebrations, bravely blamed it all on the Queen, despite knowing very well that no name could stay on that guest list without David Cameron’s explicit approval. Despite Bahrain registering the second highest per-capita deaths and arrests of the Arab Spring, the powerful of the world continue to look away. Yesterday, the US ambassador to the UN, Dr Susan Rice, insisted her “patience is exhausted” and that the “continuation of bloodshed is not only unacceptable but reprehensible”. However, she was talking about Syria, the “good” Arab Spring, not Bahrain’s “bad” spring, which apparently can go to hell as far as she’s concerned. This is hardly novel, quite the opposite. Whenever confronted with a legitimate popular uprising, this has always been the bottom line: if the ruling regime is people ‘we’ don’t like and can’t rely on, as in Syria, then power to the people! long live democracy! stop the killings! reforms are pointless! down with any ceasefires! here are some tanks! If, on the other hand, the country in question hosts the US fifth fleet, provides stable oil supplies and buys billions-worth of Western weaponry a year… well, look, there’s a reform process, and a commission of inquiry, and it’s pretty safe really and who can tell if Bahrain’s democracy protesters aren’t, in fact, evil violent extremist Shia sectarian Iranian agents? And did we mention Iran? And so on and so forth. In this context, the BNA press release is in fact supremely eloquent. It perfectly conveys what Bahrain’s rulers and their Western allies know full well: as long as power is on your side, you’re safe and can get away with anything. No wonder they’re writing themselves such adoring press releases. When David Cameron was asked about this double standard a few days ago, he airily lectured us that “Bahrain is not Syria”. He was right, of course, but in infinitely more ways than he had intended.